In last Sunday’s paper the following ad caught my eye: “Real, Fragrant Mistletoe Shipped Direct To You From the Mountains of Oregon.” I looked at the festive sprig of green leaves and pearly white berries secured with a bright red bow and smiled. I’ve got plenty of mistletoe right outside my front door, thank you. Now that the oaks have shed their leaves, I can see green azalea-sized clusters of mistletoes (Phoradendron serotinum) nestled comfortably in the bare branches. It’s interesting how this native parasitic plant comes into its own during the holiday season. For whatever the reasons, it has remained in our culture for centuries. The modern tradition of using mistletoe around the Christmas holiday season dates back to the Celts of northern Europe. Druids, the holy men of Celtic society, used mistletoe in winter solstice ceremonies. Fearing the cold, short days of winter, the Druids used this green symbol of growth to ensure the return of the sun’s warmth in the spring. Some cultures associated mistletoe with fertility because of its ability to bear fruit in winter. The Ainu of Japan chopped-up mistletoe leaves and sprinkled them on their fields to ensure a good crop. In Austria, a sprig of mistletoe was placed in a couple’s bed to encourage conception. Of more modern origin is the act of kissing under the mistletoe on Christmas Eve. It probably drew upon age-old rituals and traditions involving druidism and fertility rites. In any event, it began as a fad in England and Wales in the 18th century and has become a Christmas tradition in many households today. As a horticulturist, I’m intrigued by this half-parasitic plant. Mistletoe has leaves to produce its own food, but steals water and nutrients from its host. Mistletoe begins its life as a small white berry that is eaten and spread by birds, such as robins, thrushes, and cedar waxwings. The seed germinates within 6 weeks after being deposited by a bird on twigs and small branches. It produces “roots” that tunnel through the bark and tap the inner tissues for water and nutrients. Shortly thereafter, the seedling produces shoots and leaves. It takes about 5 years for mistletoe to flower, which occurs in the fall. Yellowish-green male and female flowers are borne on separate plants. After being pollinated by wind or insects, the female flowers give rise to berries that ripen in the winter to begin the cycle again. For the past few weeks I’ve answered a flurry of calls from residents wanting to know if those green clumps will harm their trees and how they can be removed. Mistletoe is a pest that can affect the growth and vigor of its host, and can expose the tree to attacks by diseases and insects. In some instances, mistletoe can cause branches to die back, and heavy, shrubby mistletoes can break entire limbs. In other situations, mistletoe is simply a cosmetic problem, which only affects the appearance of the tree. The only effective way of ridding your tree of a mistletoe infestation is by pruning. Cut the infected limb one to two feet below the plant because mistletoe “roots” may extend up to a foot on either side of the point of attachment. Breaking off the tops, similar to plucking off the leaves of dandelions or wild garlic in the lawn, only encourages regrowth. Obviously, pruning out mistletoe clumps from the uppermost reaches of trees should be left in the hands of certified arborists. If you’re a do-it-yourselfer, please avoid butchering the tree with haphazard cuts. Since the 1950s, scientists have been searching for cheaper and more effective methods of controlling mistletoe. Herbicides have been evaluated, but they may pose a threat to the host. 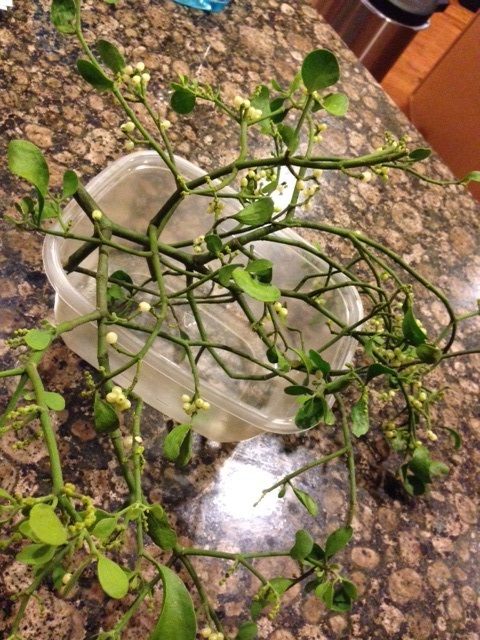 Growth hormone sprays, such as ethephon (Florel® Brand Fruit Eliminator), interrupt flowering or cause the shoots to fall off, but the mistletoe eventually resprouts and needs to be treated again. If you decorate your home with store-bought or home-grown mistletoe, hang it up high out of the reach of children and pets. The berries are toxic and the sap may irritate the skin of some people. Watch out…it also can turn Scrooges into smoochers.